Supports all versions of Windows OS Like Win 10, Win 8, Win 7 etc. 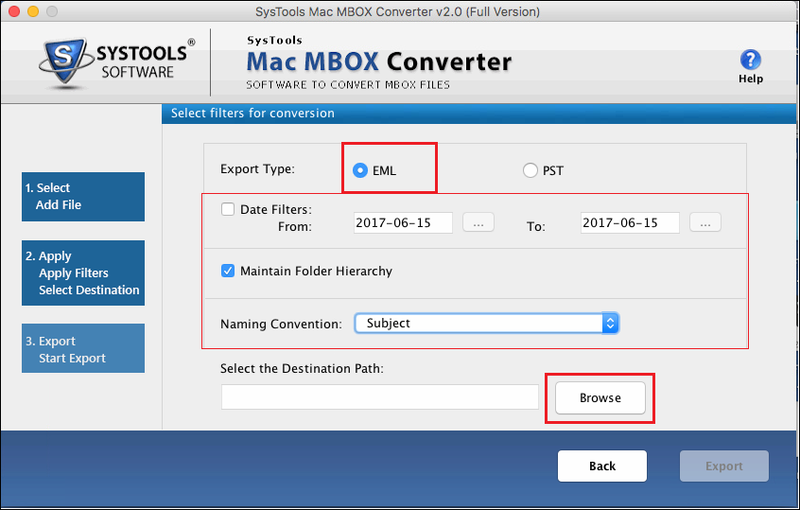 MBOX to EML converter allows users to convert entire mailbox contents of MBOX file to EML file format. It is an efficient solution that can convert data items without the need for MBOX file extension. 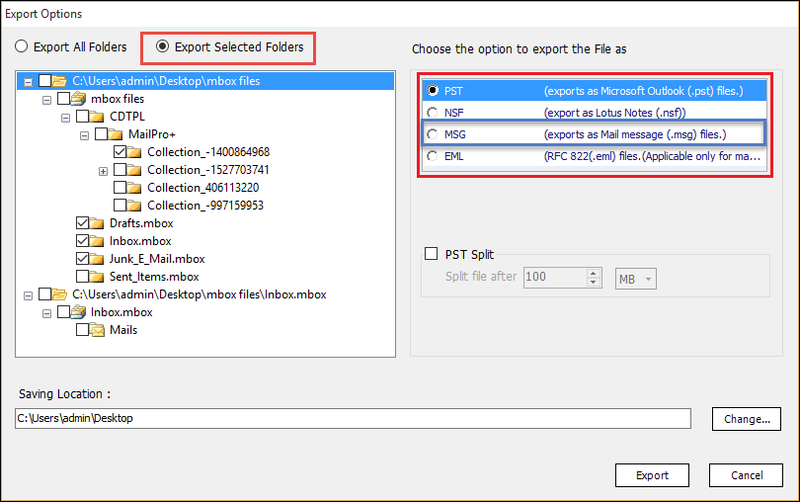 Users can convert ‘.mbox’, ‘.mbx’ file format to EML, MSG or PST file format. Outlook is not required for conversion. The MBOX to EML migration tool has the unique feature of detecting email client software installed on the system. 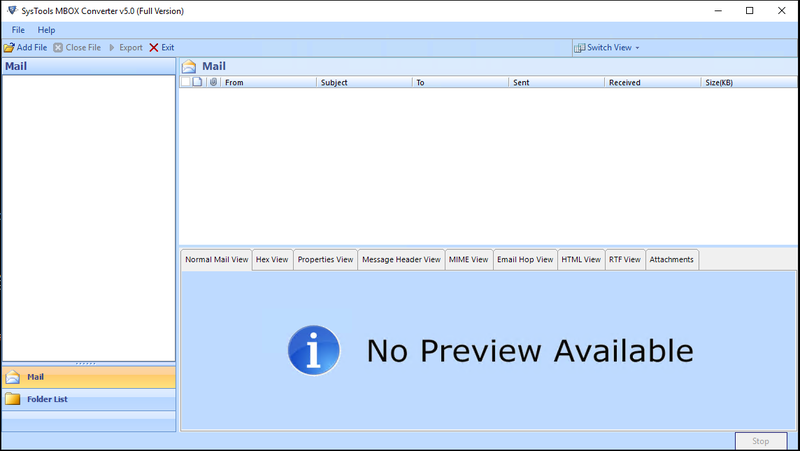 The software can simply detect the email clients that support MBOX file format. No longer is the need to browse for MBOX files. Choose from the email client list generated by the software after scanning users machine and start the conversion process. 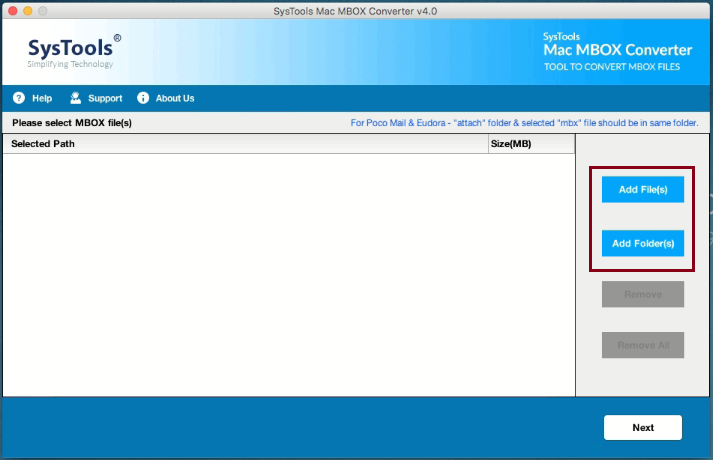 The MBOX emails to EML file Converter allow users to preview their entire contents of MBOX mailbox before conversion. Users can preview all email properties like header, body, to, cc, etc along with their respective attachments. This migration software has the added facility to skip preview and go straight to the conversion process. Users can view live status report during the conversion process. A detailed report is shown about the number of files converted, pending files and overall progress bar. This makes the software that much reliable and relevant to use. After the process of conversion is completed, an HTML report is generated. It contains full details of the activities performed during migration. Users can choose to save the conversion report in either HTML or CSV format. This file can be used for future reference to gather the details of migration performed by the software. Is this software compatible with Mac Computers? No, this software is compatible only with computers working on Windows Operating System. Does this utility tool support Windows 64-bit computers? 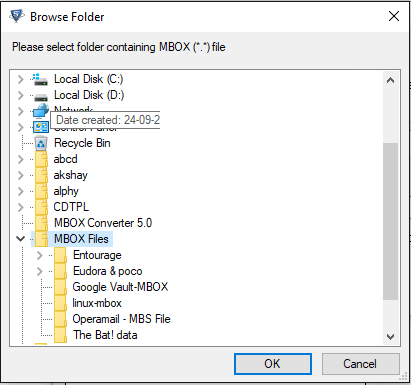 How many MBOX files can a user import into the software? 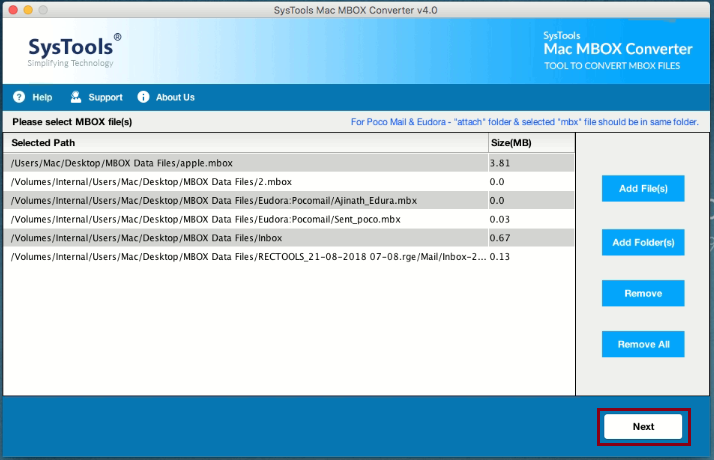 Unlimited MBOX files and folders can be loaded into the converter software for conversion. 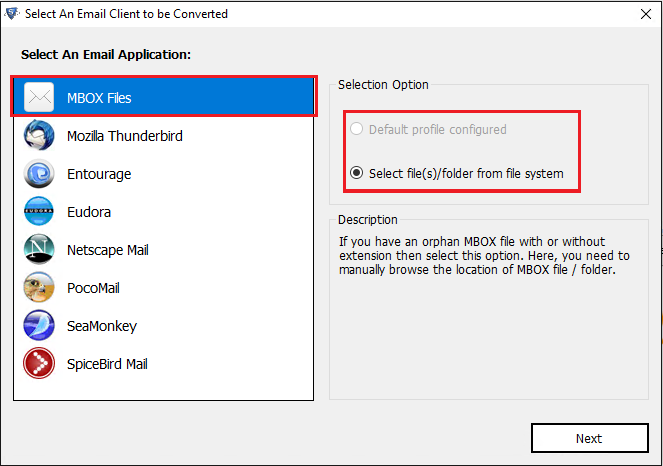 Can the MBOX files be migrated to EML file format without Outlook installation? 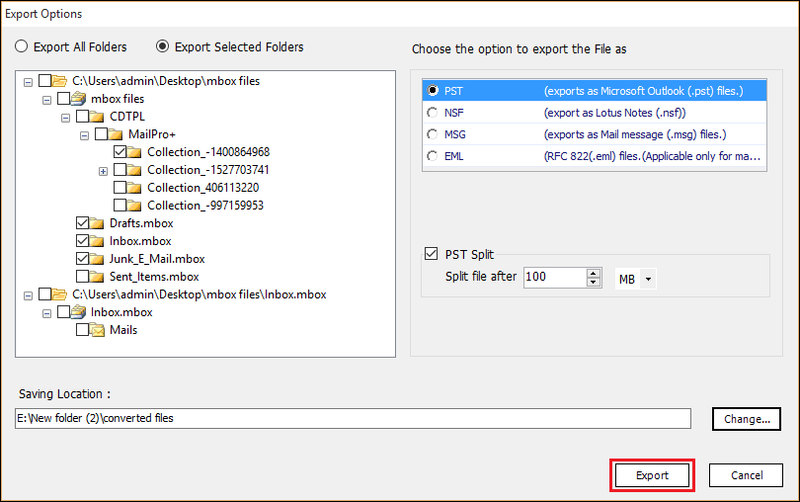 Outlook installation is needed for converting MBOX email files to EML format. Can I transfer multiple MBOX files using this software? Yes, Bulk migration is supported by this software. A user can choose to export single MBOX file or MBOX folder with multiple MBOX files. Download or buy the software and properly install it on your system. After completion of entire procedure, open converter and then, click on Add File >> Select file(s)/folder option. Hit on button having 3-dots for browsing one MBOX file from the system. 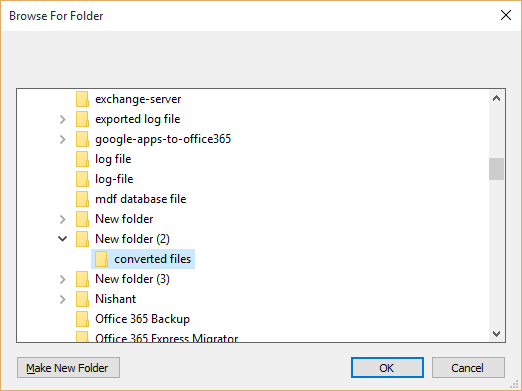 You will first have to enable ‘Use Folder Mode’ option, for choosing a folder having multiple MBOX file within it. Recommendation: In order to hold MBOX folder hierarchy select Maintain Folder Hierarchy option for the same. The entire data items of MBOX files get loaded on preview window. You can have a look on all listed data without any time restriction. 5 + different styles are provided to view messages as per your convenience. Select the location where you want to save resultant EML message files, by utilizing Change button. Choose the path and click on Export. The procedure of exporting MBOX file to EML gets displayed in front of you. You will be able to see current progress without any external efforts. Just after few minutes, software will be flashing a process completion notification wizard. You have to click on OK and then migrate towards the location, which you have chosen while exporting file. Here, you will find that all your email messages are migrated successfully in .eml format. "It is a great, easy-to-use software. It is very efficient and helped me convert all my MBOX data files to a format that can be accessed through Outlook. It was important that we converted the files. My company decided to move to Outlook Express as their email client for internal and external communication. Thank you for this great product!" "Thank you for creating such an amazing product. I used the freeware and now have purchased the upgraded version. I am very glad to have used this tool to transfer my files from one email client to another. I want to thank the development team for their amazing efforts"
Separate out individual email files from a MBOX storage folder. 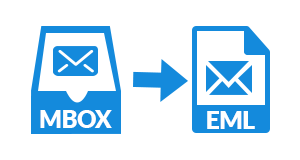 A .mbox file is a storage email folder or multiple message files. 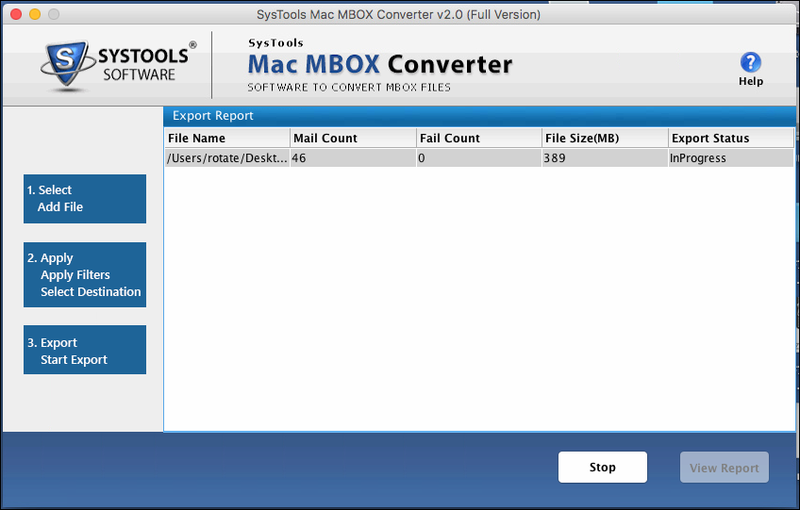 The MBOX to EML Converter tool has a user-friendly interface. It is easy-to-use and can export .mbox files with the click of just a single button. All emails are transferred along with their attachments. 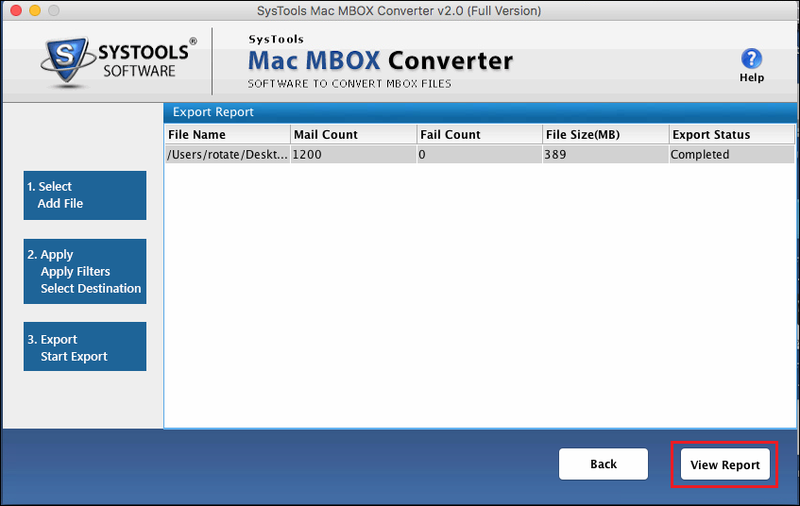 Move multiple .mbox folder files to separate emails in bulk using the Mac MBOX Converter. The tool can move complete mailbox with different folder files like Inbox.mbox, drafts.mbox, Trash.mbox to individual .eml files. 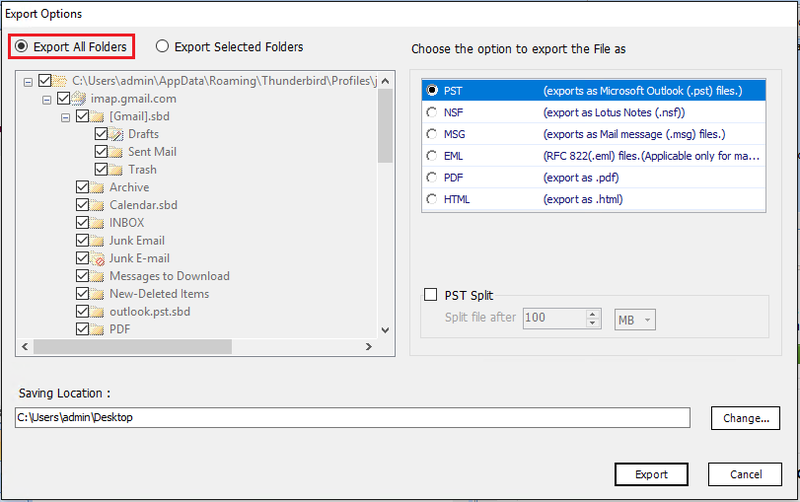 Create a different folder for each MBOX by selecting the ‘Separate Folder’ option. There is no data loss during migration. Option to apply a filter to emails by setting a range of dates on which the emails were received. Set a ‘to’ and ‘from’ dates which will limit the mailbox migration to a certain time period. This will save time and prevent any needless conversion of data. This is also a way to selectively migrate emails according to user’s choice. Choose from different types of Naming Convention to give to output EML files. Name emails according to date, subject, to, cc etc. 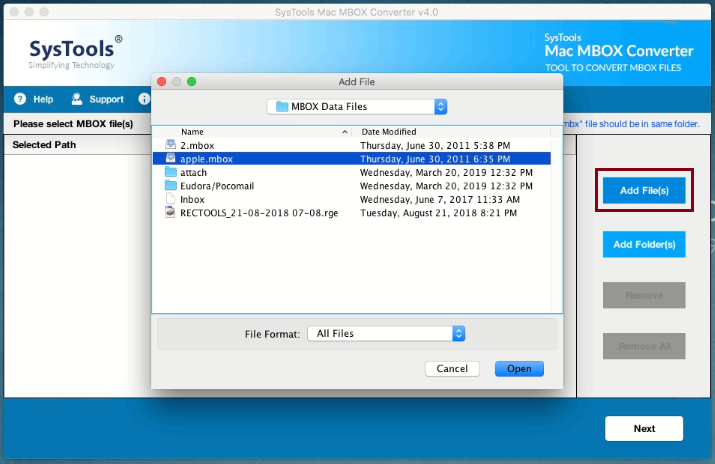 Convert MBOX files to EML in Mac operating system using the tool. The utility is compatible with all versions of Macintosh operating system including all versions Mac OSX 10.10 and above. It is important for a software to ensure data security and privacy. No email information is shared by the MBOX Extractor tool. Nor is any information used by the tool itself. Data integrity and folder hierarchy is maintained in the output EML files. The messages are found in the exact same folder as they were in original mailbox storage file. Email body and header contain important information that is kept intact when using this MBOX EML Extractor tool. The header contains information about sender details, to, cc, bcc, server information, IP address, SMTP name etc. The formatting of email body is retained during transfer. Even the images are inline with text as in original MBOX file. No, the MBOX extractor can only work with Macintosh operating system version 10.10 and above. No, this tool can only convert a MBOX file to EML file format. It can repair a corrupted file. Could you let me whether this utility is free of malware, viruses and Trojans? Yes, the tool is safe and secure to use. Just download and install the application to start extracting MBOX files. Does the tool use my email data for advertising or promotional purposes? 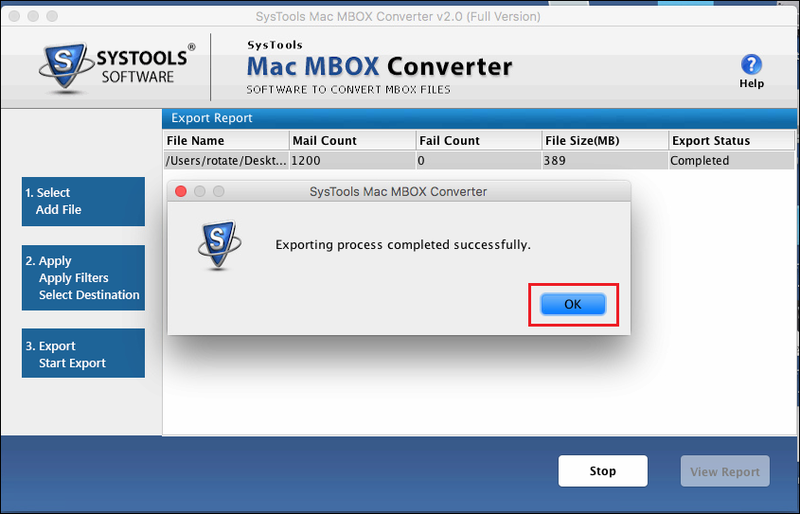 No, once the .mbox file is uploaded into the tool, it is completely safe and secure. The mailbox data is not shared with any third party or used by the tool in any way. Do I need to be connected to the internet while using this tool? No, there is no need for internet connectivity during transfer. The MBOX files can be converted when offline. 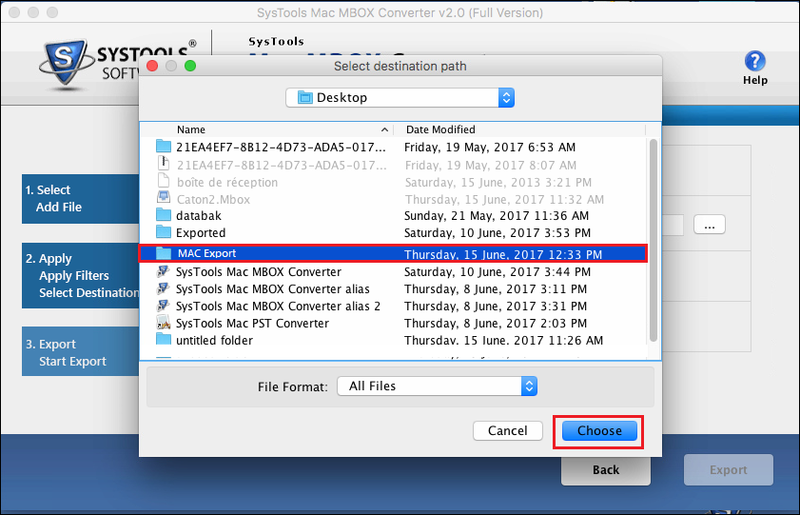 Initially, click on the Add File(s) button to upload the .mbox file into the tool. Next, Browse to the folder path where the MBOX file is saved. Date Filters: Set a ‘to’ and ‘from’ date based on which the emails will be filtered and migrated. Maintain Folder Hierarchy: Select this option to choose whether to keep folder hierarchy in output emails or not. Naming Convention: Choose a naming format for the output EML files. Select the Destination Path: Click on the Browse button to set a destination folder path where the .eml files will be saved. 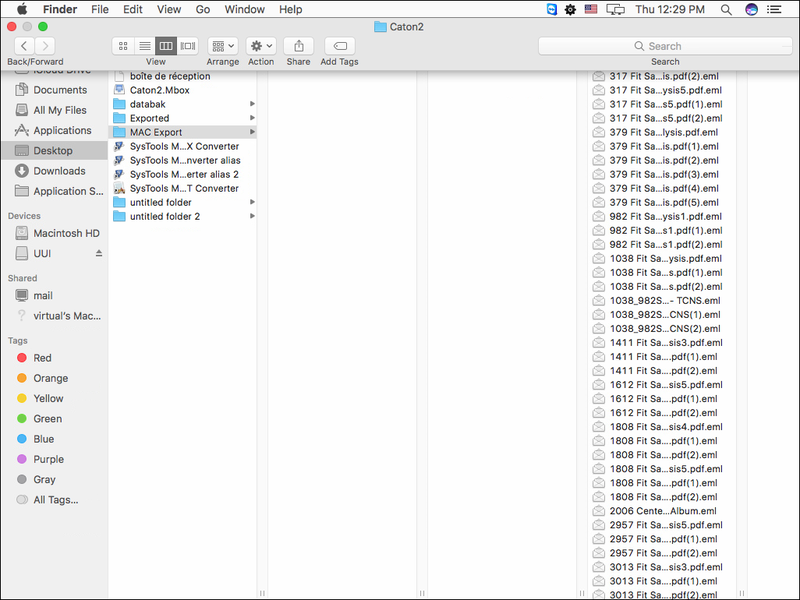 Following that, go to the folder path where the output files will be saved. Click on the Choose button after confirming the destination location. Now, the folder path will be displayed in the text box. 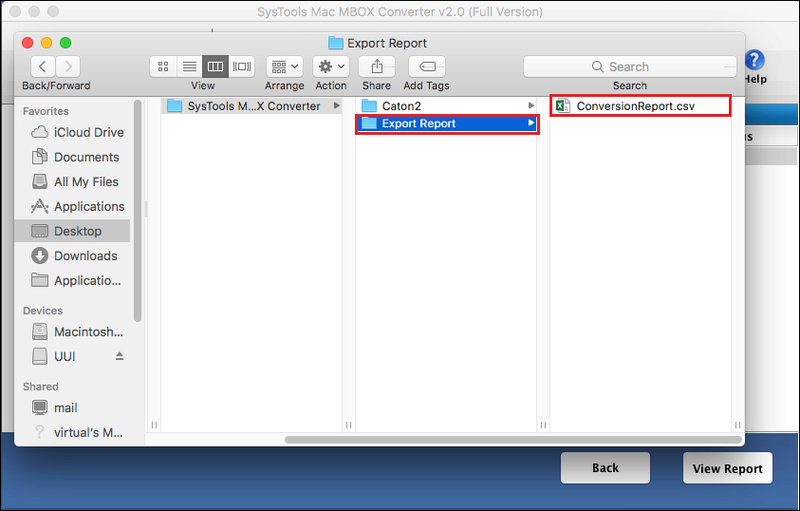 Having made the changes, click on Export button to initiate the conversion process. View the Live Progress Report Now, a live status report will be displayed containing information regarding present File Name being converted, Mail Count, Fail Count, File Size and Export Status. Next, a message box will appear indicating completion of the export procedure. Click on the OK button to move to the next step. Following that, a complete progress report will be displayed containing information regarding MBOX EML migration process. The report contains details like File Name, Mail Count(number of emails migrated), Failure Count(number of emails not moved), File Size in MB and Export Status. The exact details on each email will be saved in a CSV report which can be viewed by clicking on View Report button. 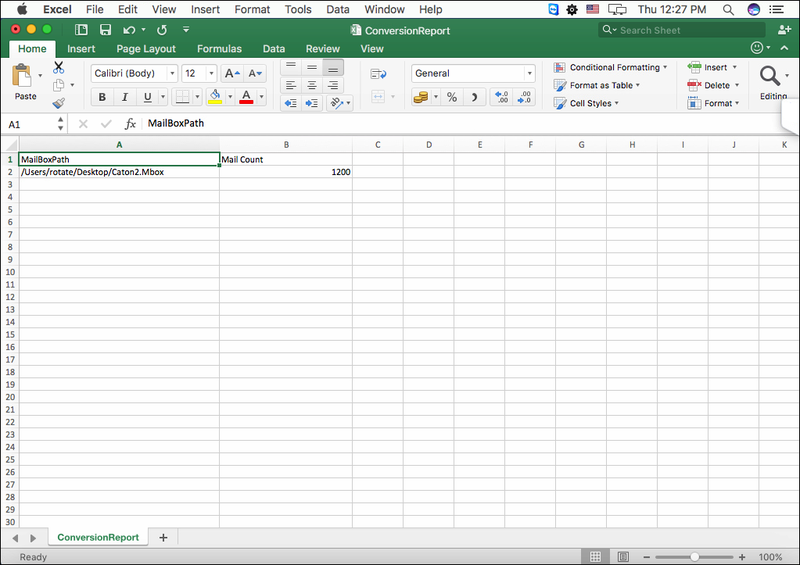 Next step is to verify the successful completion of the migration process by checking the spreadsheet report. The CSV report will contain information regarding Mailbox Path and the Mail Count. Finally, go to the Destination Path set earlier to verify whether the process has been completed successfully. Open some of the .eml files to verify if they are in correct formatting and in designated new folders. "It is a simple yet effective tool that is a one-stop solution to all email conversion needs. I could easily transport my Thunderbird folders to Outlook using this tool. All I had to do was upload the .mbox file for each email folder as the guide suggested. I was able to migrate thousands of emails to individual emails in minutes. Thanks!" "This is a revolutionary product. I was looking for a solution to move my Eudora to Outlook for years. I was using Eudora in my Mac computer for years. Since it has been stopped being supported by Microsoft, I had to look for alternatives. I preferred now to use Outlook for Mac and simply uploaded my years worth of email files using this tool."